Cloud Pub/Sub supports both push and pull message delivery. For an overview and comparison of pull and push subscriptions, see the Subscriber Overview. This document describes pull delivery. For a discussion of push delivery, see the Push Subscriber Guide. Using asynchronous pulling provides higher throughput in your application, by not requiring your application to block for new messages. Messages can be received in your application using a long running message listener, and acknowledged one message at a time, as shown in the example below. Java, Python, .NET, Go and Ruby clients use the streamingPull service API to implement the asynchronous client API efficiently. Not all client libraries support asynchronously pulling messages. To learn about synchronously pulling messages, see Synchronous Pull. For more information, see the API Reference documentation in your programming language. It's possible that one client could have a backlog of messages because it doesn't have the capacity to process the volume of incoming messages, but another client on the network does have that capacity. The second client could reduce the subscription's backlog, but it doesn't get the chance to do so because the first client maintains a lease on the messages that it receives. This reduces the overall rate of processing because messages get stuck on the first client. Because the client library repeatedly extends the acknowledgement deadline for backlogged messages, those messages continue to consume memory, CPU, and bandwidth resources. As such, the subscriber client might run out of resources (such as memory). This can adversely impact the throughput and latency of processing messages. More generally, the need for flow control indicates that messages are being published at a higher rate than they are being consumed. If this is a persistent state, rather than a transient spike in message volume, consider increasing the number of subscriber client instances. Support for concurrency depends on your programming language. For language implementations that support parallel threads, such as Java and Go, the client libraries make a default choice of the number of threads. This choice may not be optimal for your application. For example, if you find that your subscriber application is not keeping up with the incoming message volume but is not CPU-bound, you should increase the thread count. For CPU-intensive message processing operations, reducing the number of threads might be appropriate. Support for concurrency depends on your programming language. Refer to the API Reference documentation for more information. Where possible, the Cloud Client libraries use StreamingPull, a bidirectional streaming RPC for maximum throughput and lowest latency. Although you may never use the StreamingPull API directly, it is important to understand some crucial properties of StreamingPull and how it differs from the more traditional pull method. The application sends a request for messages. The server replies with zero or more messages and closes the connection. The client sends a request to the service to establish a connection. The client uses that connection to exchange message data. The request (that is, the bidirectional connection) is terminated either by the client or the server. StreamingPull streams are always terminated with a retry-able error code. Note that unlike in regular RPCs, the error here is simply an indication that a stream has been broken, not that requests are failing. Therefore, while the StreamingPull API may have a seemingly surprising 100% error rate, this is by design. To diagnose StreamingPull errors, we recommend focusing on StreamingPull message operation metrics, rather than StreamingPull request metrics. The gRPC StreamingPull stack is optimized for high throughput and therefore buffers messages. This can have some consequences if you are attempting to process large backlogs of small messages (rather than a steady stream of new messages). Under these conditions, you may see messages delivered multiple times and they may not be load balanced effectively across clients. There is a backlog of 10000 1KB messages on a subscription. Each message takes 1 second to process sequentially, by a single-threaded client instance. The first client instance to establish a StreamingPull connection to the service for that subscription will get a buffer of the entire 10K messages. It takes 10000 seconds (almost 3 hours) to process the buffer. In that time, some of the messages exceed their acknowledgement deadline and are re-sent to the same client, resulting in duplicates. When multiple client instances are running, the messages stuck in the buffer will not be available to any instances other than the first. This situation will not occur if the messages are arriving at a steady rate, rather as a single large batch. The service never has the entire 10MB of messages at a time and so is able to effectively load balance messages across multiple subscribers. To address this situation, either use a push subscription or a pull API, currently available in some of the Cloud Client Libraries (see the Synchronous Pull section) and all API Client libraries. To learn more, see the Client Libraries documention. There are cases when the asychronous pull is not a perfect fit for your application. For example, the application logic might rely on a polling pattern to retrieve messages or require a precise cap on a number of messages retrieved by the client at any given time. To support such applications, the service and most Client Libraries support a synchronous Pull method. Note that to achieve low message delivery latency with synchronous pull, it is important to have many simultaneously outstanding pull requests. As the throughput of the topic increases, more pull requests are necessary. In general, asynchronous pull is preferable for latency-sensitive applications. Not all client libraries support synchronously pulling a fixed number of messages. See the API Reference documentation for your chosen programming language for details. You may need to implement a scaling mechanism for your subscriber application to keep up with message volume. How to do this depends on your environment, but it will generally be based on backlog metrics offered through the Stackdriver Monitoring service. For details on how to do this for Compute Engine, see Scaling based on Cloud Monitoring Metrics. 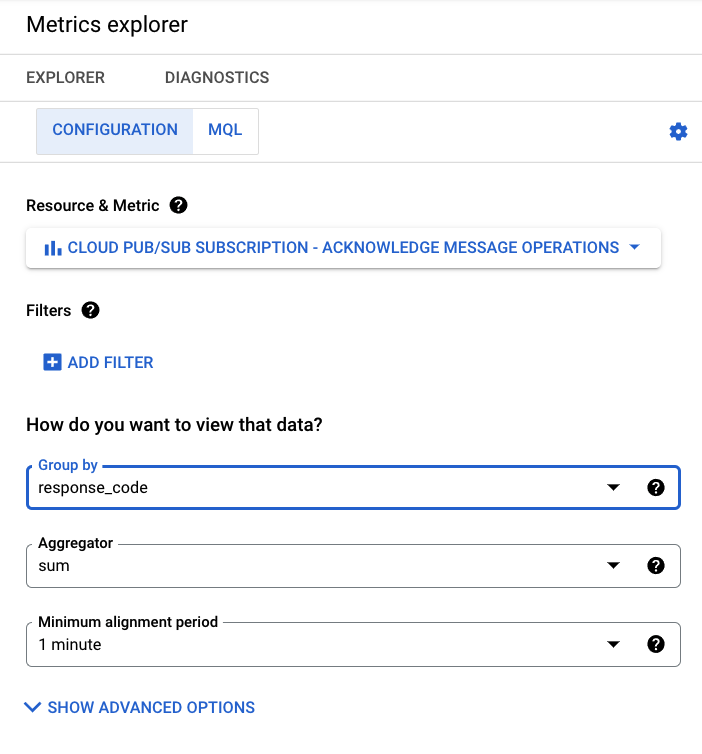 Search for "pubsub" on the Supported Metrics page of the Cloud Monitoring to learn which metrics can be monitored programmatically. Finally, as with all distributed services, expect to occasionally retry every request. Cloud Pub/Sub can send duplicate messages. For instance, when you do not acknowledge a message before its acknowledgement deadline has expired, Cloud Pub/Sub resends the message. Use Stackdriver to monitor acknowledge operations with the expired response code to detect this condition. One way to get this data is the Acknowledge message operations metric, grouped by response_code. Client libraries handle deadline extension automatically, but you should note that there are default limits on the maximum extension deadline that can be configured. If you are building your own client library, use the modifyAckDeadline method to extend the acknowledgement deadline.